Warren Lightfoot is the firm's founding partner and a leader in the practice of law. Warren attended The Citadel in Charleston, South Carolina, from 1956-58 and graduated in 1960 from the University of Alabama, where he was elected to Phi Beta Kappa. He served two years as an infantry officer, company commander and paratrooper, thereafter graduating in 1964 from the University of Alabama School of Law, where he was a member of the managing board of The Alabama Law Review. In addition to his legal work and professional involvement, Warren has devoted a significant amount of time to giving back to the community. He served as president of the Downtown Kiwanis Club in 1990 and as president of the Civic Club Foundation in 1991. 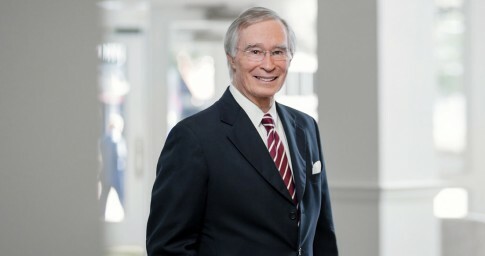 He was Chairman of the Board of Trustees of Independent Presbyterian Church in 1995, and in 2009-010, he served as president of the High Hampton Colony Club in Cashiers, North Carolina. Warren is a bronze sculptor. His portrait busts are displayed in the U.S. Supreme Court building, in the Supreme Court of British Columbia building, in the Alabama Supreme Court building, in the University of Alabama at Birmingham’s Comprehensive Cancer Center, and in the senate lobby of the Alabama State House. Other commissioned works are in private collections across the country. He has been married to his wife since 1963, and they have two grown children and five grandchildren.